Discussion in 'Windows, Linux & Others on the Mac' started by Libertine Lush, Aug 9, 2012. I ordered an rMBP and will be creating a Windows 7 partition on it. I will have my 2010 MBP (obviously with a disc drive; running Lion) at the same time, when it arrives. I'm following this guide (http://blog.laptopmag.com/how-to-install-windows-7-on-a-macbook-pro-with-retina-display) for the install. It runs through how to do the install on a rMBP with assistance of an external SuperDrive. Since I don't wish to pay the $80 for a Superdrive I'll only use once, I figured I could modify the first step in the guide by using this 2010 MBP. There are 5 steps in the guide; I don't foresee any issues with the last 4 steps. My question/problem pertains to just Step 1--also the only step I can do for now until the rMBP arrives. That is where I'm stumped. I see no such option in my 2010 MBP's Boot Camp Assistant to "copy [the ISO] to a USB drive." Am I overlooking something or is something in the guide amiss? If that is the reason for this discrepancy, presumably I can just take the non-bootable Windows 7 ISO I've already created in my 2010 MBP, transfer it to a flash drive, plug the flash into the rMBP, transfer the ISO off the flash drive onto the rMBP internal, and then the "Create a Windows 7 install disk" will create that bootable ISO in the rMBP? Bootcamp is super easy on rMBP. No external apple slimdrive needed. All that is needed is a windows 7 install iso, thumb drive, and the utility will do the rest. 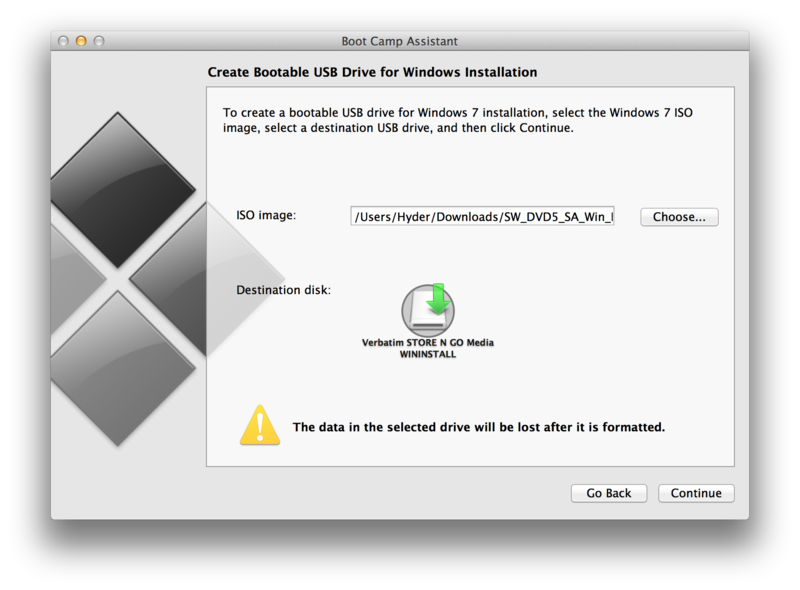 Did you both see the "Create a Windows 7 install disk" option in your rMBP's Boot Camp Assistant so you could make a bootable ISO? I'm running Lion on my 2010 MBP, so perhaps it could also be a Lion vs Mountain Lion issue. Or could it be an option available even prior to the rMBP. 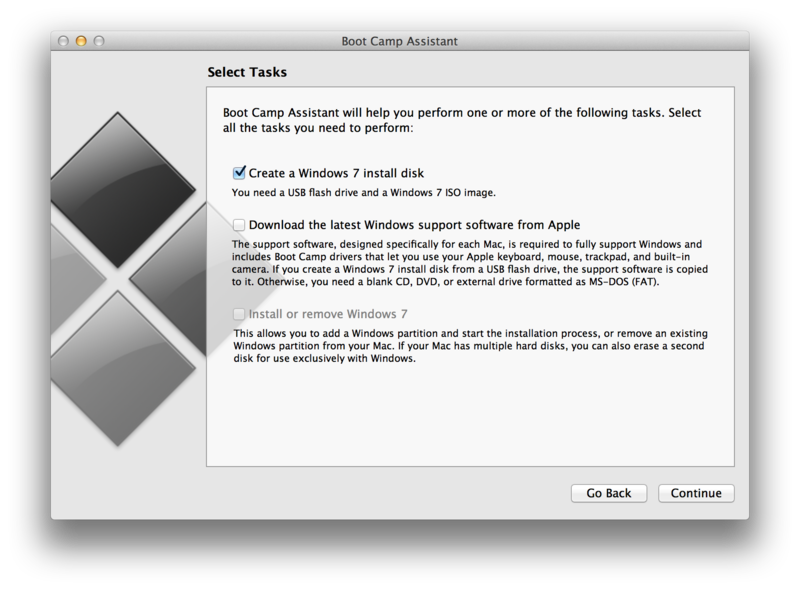 Is that "Create a Windows 7 install disk" in Mountain Lion in general or more even more recent (2011 and on) laptops? For anyone who may also be hoping to save spending $80 on a one-time use external SuperDrive: Was told in a OSX channel in IRC that they believe the "Create a Windows 7 install disk" is only available on the rMBP. So if you just move the Windows ISO from the computer you created it on, onto the flash drive, plug it into the rMBP, move the ISO on the desktop, then your USB will be free to create a bootable Windows 7 ISO with the "Create a Windows 7 install disk" option. I'll be able to test it for sure in a few days when my rMBP arrives. Thanks for sharing the screenshots. To be clear, since you didn't specify, those were taken from your rMBP? Yes, they're taken from my rMBP. I'm running Mountain Lion if that makes a difference. This is exactly what i did. You can get a windows 7/8 iso from anywhere and then create an install from that iso. However you should get a 8 gig flash drive eventhough it say 4g is enough. with windows 8, I kept running out of space when I would include the drivers on the flash drive with a 4 gig. so I needed to do the install and then separately get the windows drivers. Well, it's an inconvenience, but if you've already got a 4GB drive on hand and don't have anything larger at that moment, it's better than nothing. If you have to buy one... then yeah, 8GB+ is the way to go since even 8GB is like $5 these days.